Engineers at the University of Utah are the first to demonstrate organic topological insulators, organic materials that conduct electricity on their molecular edges, but act as an insulator inside. The study published this week in the journal Nature Communications will help pioneer a new field of research in materials science, in the same way organic materials lowered the cost and eased production of light-emitting diodes and solar cells, says senior author Feng Liu, professor and chair of materials science and engineering. 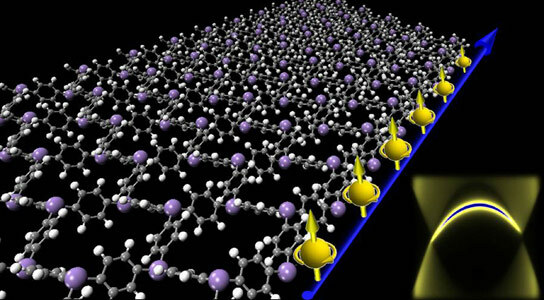 While other researchers still must synthesize the new organic topological insulators, Liu says his team’s previous work “shows we can engineer an interface between two different thin films to create topological insulators,” in which electrons known as Dirac fermions move along the interface between two films, Liu adds. Liu and his co-workers at the University of Utah’s College of Engineering performed theoretical calculations to predict the existence of an organic topological insulator using molecules with carbon-carbon bonds and carbon-metal bonds, called an organometallic compound. For this new study, the team investigated how Dirac fermions move along the edges of this compound, which looks like a sheet of chicken wire. To generate a topological insulator, scientists have to design materials that can transmit fermions. In a topological insulator, fermions behave like a massless or weightless packet of light, conducting electricity as they move very fast along a material’s surface or edges. When these fermions venture inside the material, however, this “weightless” conductivity screeches to a halt. What’s more, Dirac fermions have a property called spin, or angular momentum around the particle’s axis that behaves like a magnetic pole. This property gives scientists another way to place information into a particle because the spin can be switched “up” or “down.” Such a mechanism could be useful for spin-based electronic devices, called spintronics, which can store information both in the charge and the spin of electrons. Earlier this year, Liu and his team discovered a “reversible” topological insulator in a system of bismuth-based compounds in which the behavior of ordinary or Dirac fermions could be controlled at the interface between two thin films. Bismuth is a metal best known as an ingredient of Pepto-Bismol. These theoretical predictions were confirmed experimentally by co-authors from Shanghai Jiaotong University in China. Although inorganic topological insulators based on different materials have been studied for the last decade, organic or molecular topological insulators have not. Liu conducted the study with Zhengfei Wang and Zheng Liu, both postdoctoral fellows in materials science and engineering at the University of Utah. The study was funded primarily by the U.S. Department of Energy, with additional support from the Army Research Laboratory and from the National Science Foundation through the University of Utah’s Materials Research Science and Engineering Center. Be the first to comment on "Engineers Show Feasibility of Organic Topological Insulators"